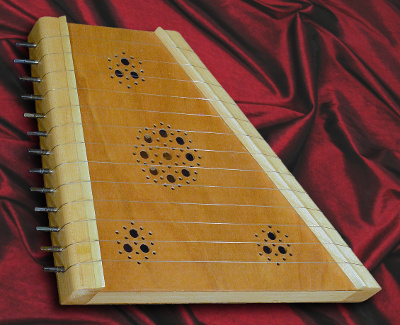 The medieval psaltery is a delightful instrument. For centuries, it was a favourite of both the clergy and the nobility. It sounds rather like a small harp, and its gentle, metallic tone is ideal for accompanying the voice. It's also highly addictive. Sit one on your coffee table, and everyone will want to pick it up and play it. 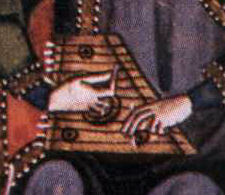 The design for this psaltery is closely based on an illustration in the 13th century "Cantigas de Santa Maria", a huge collection of poems, written in Galician-Portuguese and set to music during the reign of Alfonso X 'El Sabio' (1221-1284), King of Galicia, Castile and León. Many of the manuscripts are illuminated, and show instruments of the period. 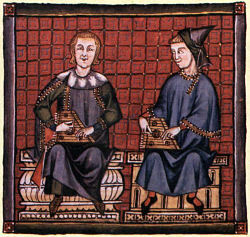 One of them (right) shows two gentlemen playing apparently identical psalteries, although closer examination reveals that one has eleven strings, the other ten. This may or may not be artistic licence, but in any case, I have expanded the set to thirteen strings, which gives a more useful range. Most medieval tunes fit nicely, and most folk tunes can be played, too. Thirteen strings is also a small enough number not to be daunting. I suspect that many three-octave psalteries stay on the shelf, because of the effort of getting all the strings in tune. To keep the price down, the back and soundboard of the basic model are made from birch plywood. It's a high quality material, and it works well, but obviously, it's modern. If you want visual authenticity, I make a version using natural woods, but it takes longer to make, so it costs more.